This area, located just a few hundred metres to the west of Cathédrale Saint-André, was initially wetland which the city strived to drain to avoid epidemics in the 17th century. A monastery for the Chartreux community of monks was built there (where the Chartreuse cemetery, created in 1791, can be seen today) but was soon destroyed and the inhospitable marshland took hold once again. When Monseigneur Ferdinand Maximilien de Mériadec de Rohan became Archbishop of Bordeaux in 1769, he acquired the land with a view to selling it on in individual plots and thus fund the construction of his new residence, which is now known as Palais Rohan and is the modern-day city hall. The architects responsible for the Palais also conceived the new district but the poorly conceived and ill-sanitised plots proved difficult to sell. The operation ran from 1772 until the first half of the 19th century, eventually resulting in a neighbourhood of échoppes and one-storey houses. The focal point of the new district (an aerial view of which can be seen here) was a square, Place Mériadeck, named after the Archbishop (with a bonus “k” added to the name). Gradually, the name came to designate the district as a whole, which became home to many of the poorest members of the Bordeaux working class. Though many cherished the picturesque streets of Mériadeck, its flea market and its village-like sense of camaraderie, the area went on to become (in)famous for its rough and seedier side, its risqué cabarets and its prostitutes. The city authorities paid little attention to what went on in the area, stopped maintaining the roads and private housing gradually fell into disrepair. 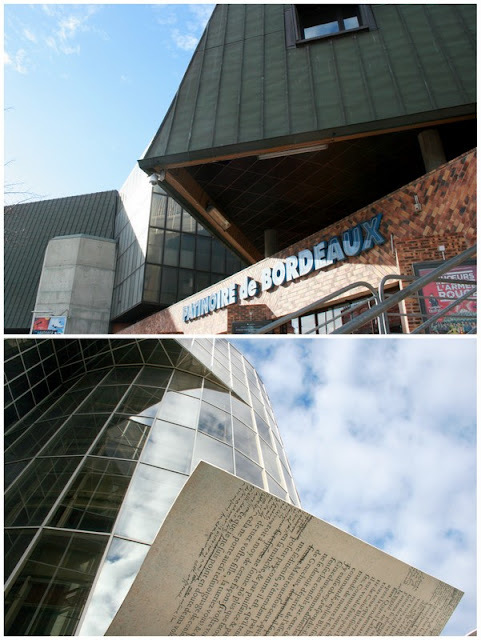 Also in 1963, Bordeaux was selected as one of the eight “métropoles d’équilibre” to drive the economic and demographic growth of provincial France. Chaban-Delmas decided that the district should instead combine housing and offices, and in 1970 (by which time the postal services were already completing a new facility in the area) a new plan was delivered by Jean Royer with the support of fellow architects Paul Lagarde and Jean Willerval, the latter forwarding the notion that all subsequent buildings should be cross-shaped, a principle that was first adhered to before being abandoned. 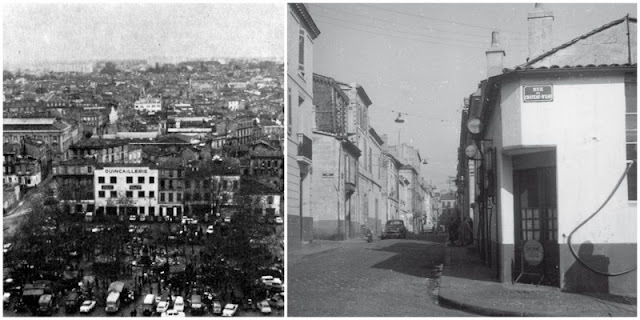 The big difference this time was the application of the modernist “urbanisme sur dalle” philosophy, which used the principle of extensive raised concrete esplanades and walkways to segregate pedestrians and vehicles. The promenade to be positioned in line with the city hall gardens was now several metres above ground level. The raised, fully pedestrianised district took shape throughout the 1970s although ironically, for many years, the walkways were not actually accessible on foot from ground level. In order to reach them, the only solution was to drive to the area, park in one of the underground car parks and access them from there! complete with the first steps up from ground level! 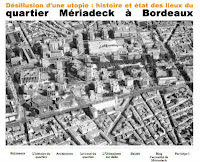 Mériadeck was struggling to attract businesses though, with notable exceptions including the bank Caisse d’Épargne, whose curious circular buildings (the 1977 work of Edmond Lay, Pierre Layré-Cassou and Pierre Dugravier, inspired by the Guggenheim Museum in New York) still stand out from the pack… and continue to do so even now that the bank’s staff have moved on to new offices down by the Garonne. The former Caisse d'Épargne offices. 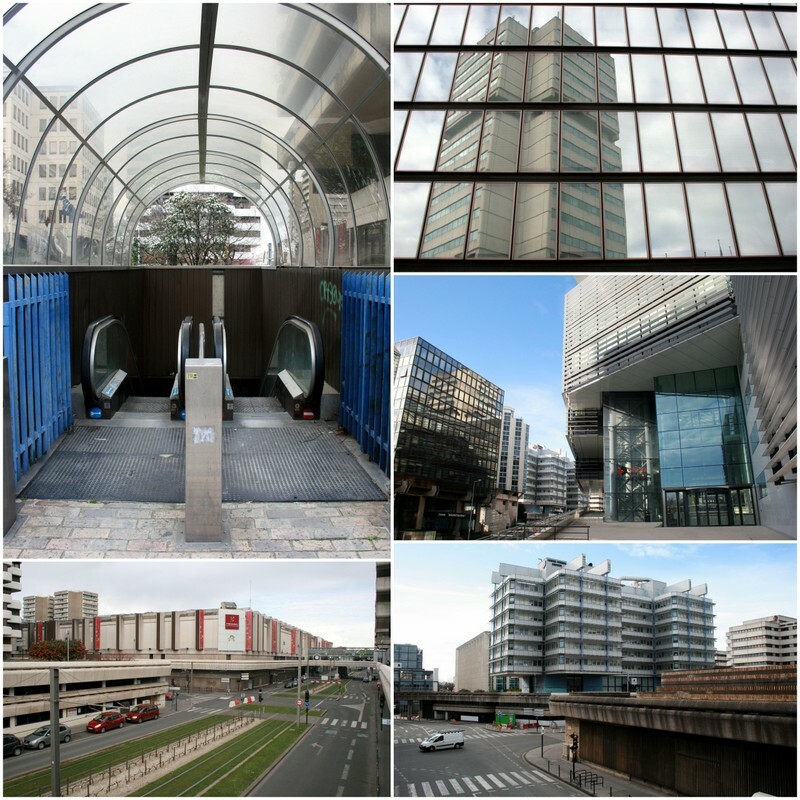 Instead, the quarter developed into a hotbed for administrative services: the offices of the Gironde Préfecture (1977), the Greater Bordeaux authority (Communauté Urbaine de Bordeaux or CUB, now Bordeaux Métropole, 1979), the Aquitaine regional headquarters (1988) and the Gironde Conseil Général (1991). Mériadeck also became a place to stay when passing through with the addition of a number of hotels (currently trading as Mercure, 1975; Novotel, 1987; Ibis and Ibis Styles, 1989). that run between the tram lines bottom left. In March 1980, Mériadeck gained a whole new commercial dimension with the opening of a major shopping centre, still today the second-largest inner-city shopping centre in France (43,000 square metres of shopping bliss, 11,500 square metres of which are a massive Auchan hypermarket). Leisure was also be added to the mix with the 1981 opening of a skating rink which, as well as catering for ice-related fun and frolics, has become established as the Bordeaux stop for arena-category rock concert tours (capacity ranges from 4,800 to 7,500). A 10-pin bowling alley followed in 1989. Finally, literature and culture would also find its home with the 1989 delivery of a purpose-built municipal library, the collections of which had previously been housed at Cour Mably. Skating rink and municipal library. 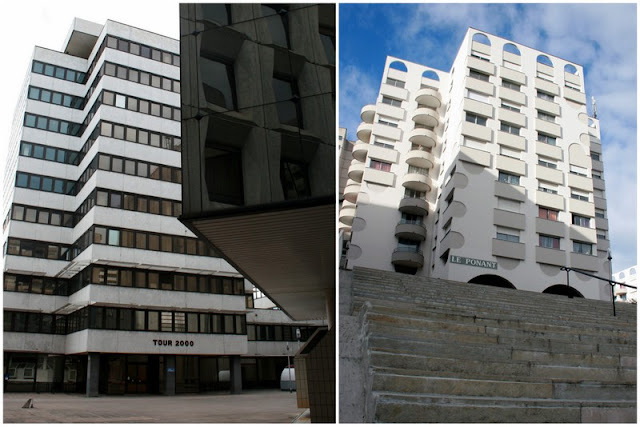 Throughout, housing programmes continued although the original figure of some 1,400 apartments was downsized to 800; an estimated 1,300 people now call Mériadeck home. And the district continues to evolve. A 1979 building, La Croix du Mail, was judged to have aged badly and has been demolished, to be replaced in the coming years by the Cité Municipale, an annex to the city hall. Over time, the segregation between cars and pedestrians has also been revised with most of the more recent buildings being accessible from ground level. The 21st-century arrival of the tram network has also done much to make the area feel less isolated from the city centre. 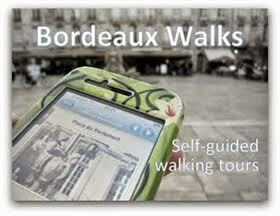 > Find it on the Invisible Bordeaux map: Mériadeck quarter, Bordeaux. 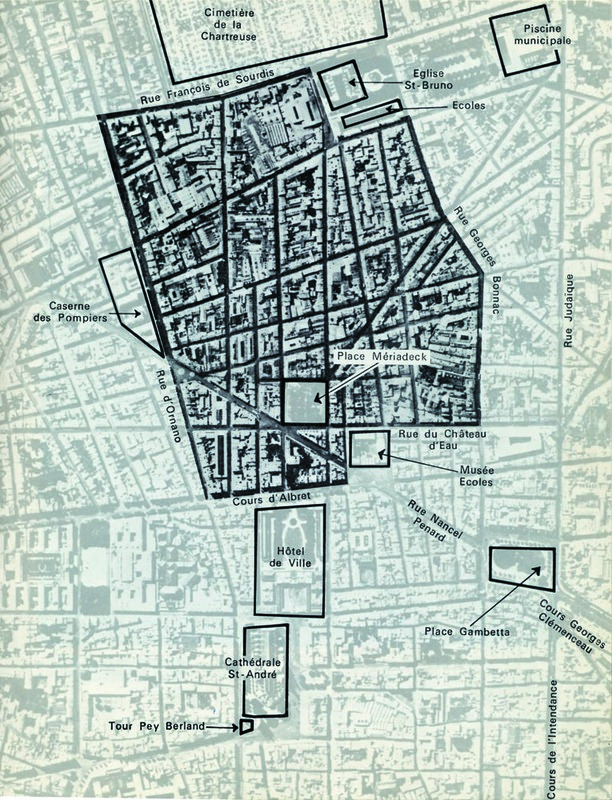 > Much of the information in this piece was adapted from the most excellent meriadeck.free.fr website, which provides an authoritative overview of the history of the area, maps and detailed descriptions of all its buildings and architecture, and updates on ongoing developments. A big thank you to the man behind the website, Mathias, who kindly agreed to me using the archive photos of Mériadeck! Please regard this Invisible Bordeaux article as a trailer to the full feature which you will find on meriadeck.free.fr! 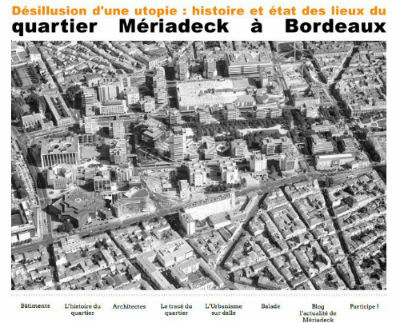 > Further information was culled from the chapter about Mériadeck in the a’urba book “De la ville à la métropole, 40 ans d’urbanisme à Bordeaux”. I think I'm the only person in my friends' circle who loves Mériadeck. Even if the 70' architecture don't look so good now, I found this district very useful : all the public services, a shopping mall, an ice hockey rink... very near to the heart of the city ! I keep promising myself I'll go along to an ice hockey match but it hasn't happened yet... would you believe I've only ever seen the venue in its concert configuration? Thanks for the feedback about the article and the layout... and I haven't forgotten about our tentative plans for a meet-up sometime soon! Don't worry, I don't forget you ! But The Pey-Berland tower is not open. We should have reopened in the begining of april but work had been delayed. We must reopened for WWII Victory Day. I keep you in touch, I hope see you soon ! All sounds good, look forward to it all taking shape! 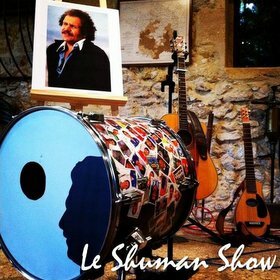 Catch you soon... and still eagerly awaiting the next episode of "MystickTroy aime Bordeaux"! Fascinating. 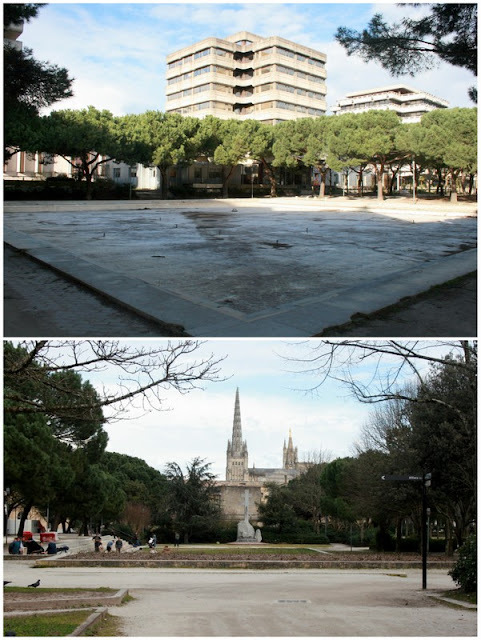 I'm a big fan of Meriadeck too - it's a pity that the outside spaces are so underused. I came across a really interesting story about Ferdinand Maximilien de Mériadec de Rohan a few years ago and blogged about it here http://lezzles.blogspot.fr/2010/06/charlotte-stuart.html He was obviously a bit of a dark horse! Oh yes, sounds like he spent a productive few years on Earth! Thanks for sharing, adds another unexpected dimension to the overall story!